Forget the Grand Prix or the Daytona 500, the real race right now is the race to Damascus. 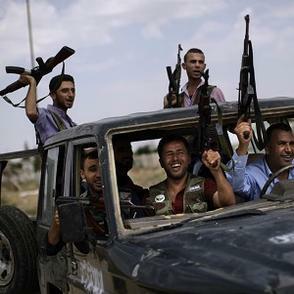 The racers include Syrian rebels in pickup trucks with mounted machine guns and homemade tanks, toting weapons and equipment supplied and paid for by Qatar and Turkey, and more covertly by the British and French intelligence services. Racing along with them are carloads of international diplomats urging their governments to give the militias more money and more weapons. Everyone is on the road to Damascus in this amazing race. 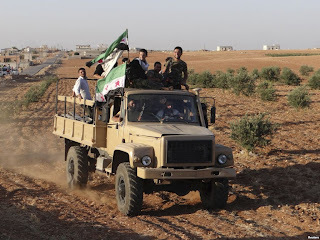 Christian refugees from Aleppo and Alawites packing in behind the tanks of the Syrian army, Iraqi militias that used to plant IEDs in front of American Humvees who have found new work blowing up churches and taking over Syrian bases. There are international activists from around the world, reporters or citizen-journalists embedded with the rebels, Russian advisers embedded with Syrian units, Qatari trainers turning children into child soldiers with the rebels and Turkish officers trying to get the entire rabble moving in the right direction toward Damascus. The Iranian Revolutionary Guard and Hezbollah's militias out of Lebanon are shooting at Al Qaeda and Muslim Brotherhood militias from across the Middle East and even Europe in one of those unique displays of family entertainment that you wish would go on forever, but that won't, because despite the Hasish-fed bravado, supplemented with meth from Iran's top laboratories, the whole shooting match only as long as it takes the side with the weakest bladders to run away, and then both sides brag about their great victory on YouTube and Facebook. Imagine the Crips and the Bloods, armed to the teeth by every country from Mexico to China, fighting over the ruins of California cities, and you get some idea of the glorious Syrian civil war being fought by the Brave Syrian People, most of whom at this point are about as Syrian as the Palestinians are from Palestine, in a conflict that will determine once and for all who will be ethnically cleansing who this year. The Syrian rebels are Sunni. The Syrian regime is Alawite, which is close enough to Shiite in a region where most Sunnis hate Shiites. This isn't some heroic battle between the people and the dictator; it's a religious war. And in a newly Islamist region, religion is the best possible reason that anyone can think of for a war, that will just incidentally happen to realign a strategic piece of territory from the Shiite axis to the Sunni axis. And we, as befits the nation that Obama described as one of the largest Muslim countries in the world, happen to be in the Sunni axis, ensconced somewhere between the fattest child-molesting members of the Saudi and Qatari royals, the most vicious Turkish and Egyptian Islamists, and the Eurocrats looking to score oil deals with the former and arms deals with the latter, and political points with their domestic population of Sunni Islamists who have the unfortunate habit of blowing things up. On the road to Damascus, the politicians and pundits tell us that we cannot simply sit things out. Someone is bound to remove Assad and we had better be in good with whoever does. The UK, which dragged Obama into Libya the way an elderly lady drags a poodle into a pub, is frantically urging us to stop just looking the other way while Qatar and Turkey arm the Syrian rebels, and to get into the rebel-arming business ourselves. Considering how well that worked out in Libya, not to mention a certain obscure part of the world, known as Afghanistan, that we never heard from again, we should probably hurry and start arming the Syrian rebels right now. The sooner we give them weapons, the less likely they are to use them against us. Or so the reasoning of the people who brought you Iran, September 11 and September 11 II: The Mohammed Video Diaries goes. And with a track record like that, how could they be wrong? If we give the right Syrian rebels the weapons, then they will win, instead of the wrong Syrian rebels. But if we don't, then the wrong Syrian rebels will win, and even the right Syrian rebels will hate us and turn wrong, and before you know it they'll be shooting at us with the weapons we didn't give them. Telling apart the right Syrian rebels from the wrong Syrian rebels is tricky. The Free Syrian Army, once hailed as a moderate secular organization, has more Al Qaeda in it than the dirt in Tora Bora. The new opposition set up by Obama and Qatar consists of the Muslim Brotherhood and people with fake mustaches pretending not to be the Muslim Brotherhood. As an additional handicap, the head of this moderate secular opposition, Sheikh Mouaz Al-Khatib, who had previously praised Saddam for "terrifying the Jews", objected to the American declaration that the Al-Qaeda militias are terrorists. 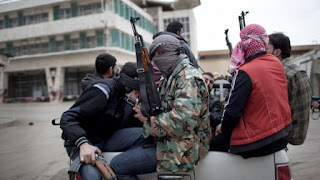 "The logic under which we consider one of the parts that fights against the Assad regime as a terrorist organization is a logic one must reconsider," Al-Khatib said, and it's hard to argue with his logic. The difference between the Muslim Brotherhood and Al Qaeda is that the Muslim Brotherhood wins an election before shooting people in the streets while Al Qaeda shoots people in the street without waiting for an election. To the Democracy Uber Alles crowd, this makes a big difference, but the people being shot are still dead either way. No serious thinkers seriously think that not siding with either side is an option. When confronted with Muslim terrorists, they begin searching for moderates in the rubbish bin, and with a working definition of a moderate that includes anyone less extreme than the most extreme of the extreme, they never have a problem finding moderates. And they keep finding moderate Syrian rebels who will be our friends tomorrow for a few RPGs today. Today we have to support the Muslim Brotherhood for fear that Al Qaeda will take over. Tomorrow we will have to support Al Qaeda for fear that Al-Takfir Wa Al-Hijra will take over. And then we'll have to support the Takfiris for fear that Itbach Al-Kul Ulum will take over. And the day after our leaders will have no choice but to nuke the entire planet for fear that an asteroid will hit it instead. The radiation will be bad, they tell us, but at least nuclear weapons are moderate. Asteroids are extreme. And no one, except skateboarders, wants to be extreme. It's Black Friday in Syria and just sitting at home, watching the game, sipping a beer and wondering who's going to score in the third quarter, the black flag Salafis, the Muslim Brotherhood militias, Hezbollah or a race of demons erupting unexpectedly from the earth to devour all participants, never occurs to the bright boys and girls down in D.C. No, they're dragging us into line at five in the AM in the hopes of scoring a friendly Syria for only 4 billion dollars and maybe only twenty-thousand dead Christians. The rebels are making their gains, or so the New York Times claims, while Pravda claims that the Syrian government is beating back the rebels. It's hard to know whose pravda to believe when all we have to choose from are propaganda outlets that parrot the talking points of their respective governments. In a Pravda world, you don't read the news to find out what's going, you read the news to find out what the government thinks about what is going and then you try to derive from that what is truly taking place. In this Plato's Cave version of the news, all that we know is that everyone is racing to Damascus, and that everyone is winning and everyone is losing and everyone is dying at the same time. And we're rushing right along with them, hoping that our guys, who are slightly less murderous than their guys, will defeat them, despite the murderousness gap, with the help of our weapons, our planes and maybe a few of our guys, wearing sneakers and long beards, coordinating operations on the ground. The Muslim Brotherhood is running torture chambers in Egypt and shooting protesters in the street, but we're still shipping them free F16s and helping them take over Syria. Because if we don't help them, how will we have any influence over them? If the Muslim Brotherhood can't non-violently seize power in Syria through a violent civil war, there is a risk that they will turn to violence again. And that means they'll start trying to violently take over countries without going through the formality of fighting a civil war to take them over first. Every leader of Al Qaeda was a member of the Muslim Brotherhood, but since the Muslim Brotherhood, like the New Left, is willing to non-violently take us over through front groups and immigration, rather than flying planes into buildings, they're our idea of the good guys, even if they have the same objectives as Al Qaeda, just a different way of getting there. But then again you could probably say the same thing about the people who were running the USSR in 1932 and the people who are running the United States and the European Union in 2012. The Muslim Brotherhood isn't satisfied with Egypt. Al Qaeda isn't satisfied with Mali. Iran isn't satisfied with the hypocrisy of agitating for the rights of the Shiite majority in Iraq and Bahrain and the rights of the Shiite majority in Syria. Obama isn't satisfied with wrecking just Libya, Tunisia and Egypt. Russia isn't satisfied with financing 50 years of war in the region even though it's on the verge of bankruptcy. Prime Minister Cameron of the UK and President Hollande of France aren't satisfied with being on the verge of bankruptcy and only wrecking Libya. And like Bob Hope, Bing Crosby and Dorothy Lamour, they're all on the road to Damascus. Or the road to hell. And so on we go, all together, rebels and diplomats, throat-slashers and powdered-hair personalities, embedded into a conflict, racing to Damascus, eager to raise the flag, report on the historic moment, negotiate deals and deliver speeches. Obama probably already has his written and it will probably be the same exact speech he delivered when Mubarak fell and Gaddafi got sodomized to death after his convoy came under fire from an American drone. There will be lots of moving sentiments about hope and change, peace and freedom, the choice of the people and the transition to democracy. This road picture has the usual participants. The Western diplomats who fell in love with the region, its culture and its people. The Western politicians still dreaming that the region is just one more revolution away from peace and stability. There's the fourth son of some upper middle class family who grew his scraggly beard long and now dreams of dying as a martyr for the Caliphate surrounded by white doves and even whiter virgins. There's the Qatari weapons trainer teaching 13-year-olds how to plant IEDs and the Russian colonel, underpaid and hating the locals more than ever, trying to get the ragtag locals to fight. There's the embedded citizen journalist with fourteen differently colored keffiyahs in his luggage blogging his experiences on Tumblr and the gang of local thugs who alternate between taking potshots at Syrian army positions on behalf of the Free Syrian Army and its Qatari and Turkish paymasters and kidnapping some of the wealthier residents for ransom, which pays even better. There are Sunni and Shiite militia members from neighboring Lebanon and Syria. There are Pakistanis fresh from Waziristan and Libyans looking for a good brawl. There are Scud missiles and chemical weapons and broken buildings, torn corpses and roads full of refugees fleeing for their lives. There are tanks and jets and fleets. There are armies and militias, truckloads of weapons and bodies, fire behind them and death ahead of them. And they're all hurrying, running and racing to Damascus. And then the real killing will begin. This is such a no-win situation in Syria. But its also what you get when the powers that be, turned a blind-eye to the atrocity that Syria was for decades. But this the same thing the world did with entire Arab Middle East. As long as the dictators kept the oil flowing and their people quiet, the west could fool themselves into thinking the region was stable. They allowed the suppression of democratic ideal, liberal thought and true push for freedom. So what we have now is the only organized force taking over, the Islamists in the guise of MB and their erstwhile offspring al-Queda. One would think that eventually the west would tire of realpolitik, but it seems they really never do learn their lesson. This is only the beginning and all hell is about to really break loose, where once again the west will happily sacrifice another 6 million Jews for "Peace in our time." The upside to all of this though, is 'so what'? We are happily at the point now in Syria where it had descended to African civil war levels. It is now beyond the point where you can call it a 'conflict' and it is instead, a perfect state of permanent savagery and anarchy. It is now a war that will never end. It has become the Arabs Vietnam death machine sucking in all their gangs and monsters and small arms and everything. A black hole of insanity that will consume them. If anything, we should be giving small arms and low level military aid to EVERYONE involved until it turns into the Arabs Rwanda. Let them kill and each each other to the last one standing. "Al-Takfir Wa Al-Hijra" and "Itbach Al Kul Ulum". LOL! That's absolutely priceless! I look forward to representatives of these two fine organizations debating the Palestinian Minister of Uncontrollable Rage and the newly appointed Egyptian Minister of Conspiracy on the next Tribal Update. John Zelokoreli will have to apear with them to represent the Obama administration's position on the definiton of "moderate". Flock Builder can moderate. Dear "Elise Ronan", are you for real? Please get a clue! Syria was what it always was because Syria is populated by Moslems. The West has nothing to do with any of it, except insofar as failing to nuke the entire Moslem world counts as a general failure. Elise stop being a paranoid martyr. How senseless. 52millions perished in WW2 all of them important to someone. Then we have the genocidal Moshe who wants to nuke all Arabs ever existing and says so right in his response. And they get away with this talk. It is unforgivable that Western leaders regularly finance, arm, and sometimes even wage war for the most radical, savage Muslim terrorists. How far and how low Western civilization has fallen under these immoral Western leaders. Planting kudzu in our victory garden. I'm all for muslim terrorists killing each other. The more dead terrorists the better. It apparently makes them happy to be killed ("We love death like you love life")and we're not being attacked by terrorists who are too busy killing each other. Dead mussie terrorists on both sides. Now that's a win/win situation. If the race to Damascus means more dead terrorists, wave that starting flag! Pedal to the metal! Brilliant - one of your best. Especially liked this perfect summation of the left's attitdue: "And the way that you think of a dog, is the way that the left thinks of you. When you misbehave, the left looks around for your owner." I don't know how you take such a serious subject and make me laugh to tears, but you do.